Relax and get away from it all on Bois Blanc Island. Located in the Straits of Mackinac, ideal for those who desire a quiet serene escape to enjoy nature and watch the ships pass by. Surrounded by two acres of woods with a large rocky beachfront on Lake Huron, the only sounds you'll hear are those of the leaves rustling in the trees and the waves lapping on the shore. Swimming is available at your doorstep. Hiking and superb fishing at three inland lakes or on Lake Huron is an adventure. Bois Blanc Island is located minutes from Cheboygan where you'll catch the car ferry. Day trips to Mackinaw Island, Petoskey, Charlevoix or the Upper Peninsula are great options if you need a dose of civilization during your stay. BR B Amenities: /B BR Two bedrooms (sleeps 6), fully equipped kitchen, refrigerator, stove, microwave, charcoal grill, TV, VCR, linens, towels, washer, dryer. Sorry, no smoking, no pets. Residing in Texas, the Cook's love spending time at their home away from home, Bois Blanc Island. Karen grew up spending summers on Bois Blanc, so when we had children, we wanted them to get to know the Island. The boys, like their parents have come to love and appreciate Bois Blanc with all its unique discoveries. We look forward all winter to spending our summers on the Island. The privacy of Cook Cottage is what first attracted us to this property. The cottage is set away from the road, when we don't want to see or hear civilization, this is the perfect spot. The east end of the Island has beautiful sunrises and is close to Mary's Lake and trails for discovery. The beautiful view from the cottage down to Lake Huron provides an excellent view of wildlife including eagle, deer and the like. The cottage is bright and cheerfully decorated with a lighthouse decor. Nights spent viewing the Milky Way from our beach front is uniquely spectacular, as we don't have the light pollution from the mainland. Awesome!! Large spacious closet in bathroom. All bathroom linens provided. Beach towels provided for your convenience. Washer and Dryer in bathroom. Full size tub and shower. Get back to nature at our peaceful Cottage. Explore Bois Blanc Island's gravel roads as you re-connect with nature in this unexplored wilderness. Lake Huron lies just steps away from our front door. We are NOT behind a road, or in the interior of the Island, but right on the beach. Step out the front sliding door and you are steps away from your own private beachfront. Enjoy the view from the cottage, or from chairs at the shore. Nestled among the trees, Cook Cottage provides a gorgeous sweeping view of Lake Huron. Come experience our beautiful sunrise! Our water front is rocky, water shoes will make your exploration of our beach more comfortable. Over 100 feet of Lake Huron waterfront afford spectacular views from our East facing cottage. Our day begins with gorgeous sunrises and dramatic freighters and pleasure boats cruising Lake Huron to the stunning sight of cruise ships and freighters lit from stem to stern at night. You'll be awestruck when you see the Northern Lights from our beach at night. You'll know you're in a special place when viewing eagle, deer, turkey, loons, cranes and swans, butterflies and hummingbirds. 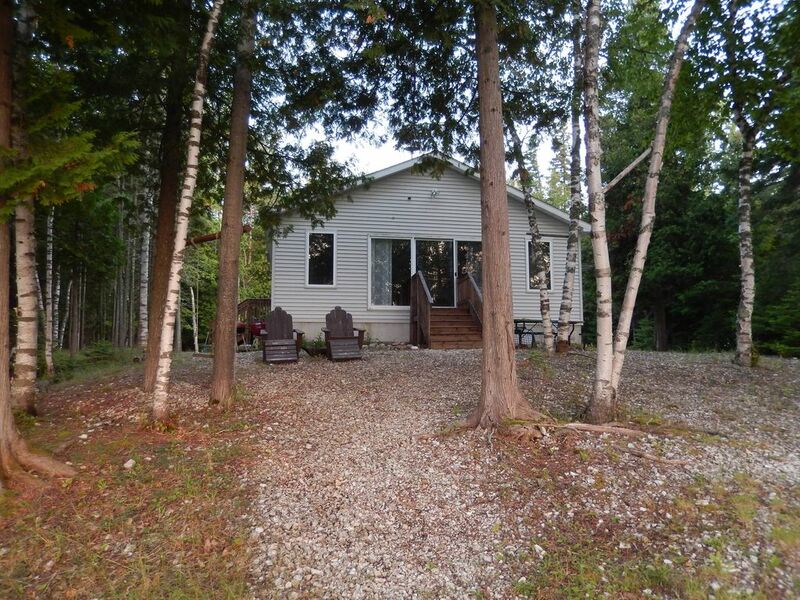 Beautiful wooded drive from the main road down to the cottage provides privacy and seclusion. For your convenience we have a picnic table, child swing set and garden chairs. A large fire pit on the beach makes s-mores and a wiener roast a must during your stay. Starter supplies for cottage including toilet paper, paper towels, trash bags, dish and hand soap are provided. All kitchen and bath linens provided. All bedding is provided. Your place was all we could have asked for, very clean, peaceful & scenic. This charming cottage, overlooking crystal clear blue water, is just heavenly. We loved it! My family and I had the most amazing 4 days on BBI: catching frogs, marveling at amazing rocks, waking up for sunsets and just relaxing. Cook Cottage was peaceful and just what I was seeking to escape the stresses of everyday life (at least until the last night, when we had some very loud neighbors move in to Grandpa Bob’s). We really enjoyed exploring the island, seeing wildlife and the friendliness of the islanders. We would absolutely love to come back sometime. Great experience in amazing location. Highly recommended. Family memories are precious. So glad you were able to make some good ones at Cook Cottage. You are welcome back anytime!! Most amazing time ever!!!!! Loved every minute!! This short vacation of ours was the best yet. From the lovely cottage to unbeatable views and sounds of the lake. Non of us wanted to leave!! I loved the butterflies while husband and the kids couldn’t get enough of the fish in lake Mary!! Will definitely return for more!! This place is amazing! So peaceful on the water listening to the waves and the breeze in the trees. Our kids loved having the lake just steps from the back door for swimming and skipping stones. Definitely bring water shoes though as the bottom is rocky. The cottage was clean and comfortable with everything we needed. We can't wait to start planning another trip back!! I am so pleased you enjoyed your time on the Island. We are excited to welcome you and your family back to our Island paradise. What a pleasant, clean, spacious cottage with a breathtaking view of Lake Huron! Well supplied with linens, towels, and board games. Washer and dryer made it easy to pack light. No internet, not the best cell reception, which was a huge plus to us; our teenagers "detoxed" surprisingly well! Hubby and son caught tons of bluegill and bass in Lake Mary and had a great time. My daughter and I had some very precious 1:1 time hiking to the lighthouse. We all took turns cooking and baking. Our oldest bought an inflatable raft, losing an oar on Lake Mary and making her mother have to swim across to get her (you don't get many opportunities to play 'hero' to the kids when they get into those late teen years!). The highlight was the Coast Guard Chapel for nondenominational Sunday services. The building was so lovely, the old boathouse-turned-chapel opens its big doors up for the service to a quiet, serene forest. Rarely have I been in such a holy place! Karen, this was such a special break from our crazy lives, God bless you for sharing your special place. One thing to mention is that Hawk's Landing, the community's store, is currently closed. ALL groceries and needs need to be brought across on the ferry. Ferry for Bois Blanc Island leaves from Cheboygan Michigan, about 30 miles east of Mackinaw City. Bois Blanc is a rustic, secluded Island gem in the Straits of Mackinaw. Accessible only by car ferry or airplane, a car is required for the Island. One General Store/Gas station/Restaurant with internet access serves the Island. Provisions should be purchased on the mainland and brought with you. Alternatively, stores in Cheboygan can pack and send groceries/supplies on the ferry for a small fee. Please note: Ferry only accepts cash or personal check, NO credit cards. Other Activities: Miles and miles of hiking trails, inland lakes and beaches to explore. Freighter watching is a favorite past time - day or night! Without all the city light pollution, we are in a prime spot for star gazing.